The CertiflexDimension Business Accounting series provides mid-range enterprise level accounting solutions at entry level prices. Since the first evolution of Certiflex accounting software in 1979, this series has provided a powerful, flexible solution to a wide range of business operations and industries. CertiflexDimension Professional Accountant series provides solutions for accountants in after-the-fact accounting, financial generation, payroll services, tax reporting, and other professional service tools. This solution can help expand the services you offer and positively impact your accounting practice’s bottom line. If your company was identical to other businesses, any accounting software system would work as well for you as it would for your business challengers. However, since your business is unique, the CertiflexDimension software platform can be custom tailored to provide a solution molded to fit your unique business. Information exchange is essential. Whether you are moving from another accounting system or wanting to integrate your data with other apps, CertiflexDimension can handle your needs with a flexible & intelligent import/export feature. CertiflexDimension provides controlled access rights by user, specific applications, companies, tasks & company/task combinations, providing business-critical data protection. Our customization services save you time, money and resources by directly making changes to the actual software code to fit your precise needs. We've been providing custom software services to Certiflex and CertiflexDimension products since 1992. Our accounting software is backed by over 30 years of experience in innovative accounting software design & award-winning service. Our software is consistently ranked as a top performer by industry publications and surveys. With over 400 standard reporting & analysis features, CertiflexDimension meets the needs of demanding customers. 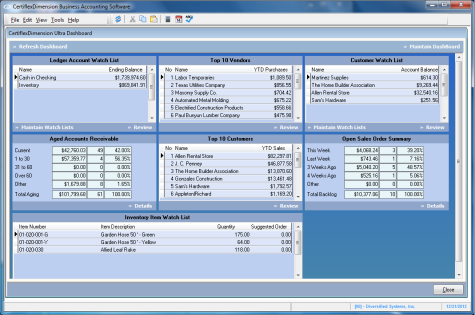 The comprehensive scope & flexibility of our Financial Formatting System is virtually unparalleled in the industry. CertiflexDimension processes, organizes, updates and reports an enormous volume of accounting data with incomparable speed by utilizing the Pervasive.SQL scalable database. CertiflexDimension provides the flexible scalability your growing business needs. Payables. Inventory control. Job Cost. Accounts Receivable. Forecasting. Any of these tasks and more might occupy your day. You need a tool that is as flexible and productive as you are, that can expand as your business grows and that will perform efficiently and effectively. CertiflexDimension business accounting software will meet those demands. Whether you’re a bookkeeper, data entry clerk or controller in the business office of a manufacturing firm or a CPA in a professional practice, you’ll enjoy the ease in which CertiflexDimension fits into your environment. Divided into functional modules, CertiflexDimension, assures accuracy, flexibility and reliability. Hundreds of industry-leading features are designed to provide more timely financial information and empower you with better control. Ready to see how Dimension can benefit your business?